How Cold Is It? 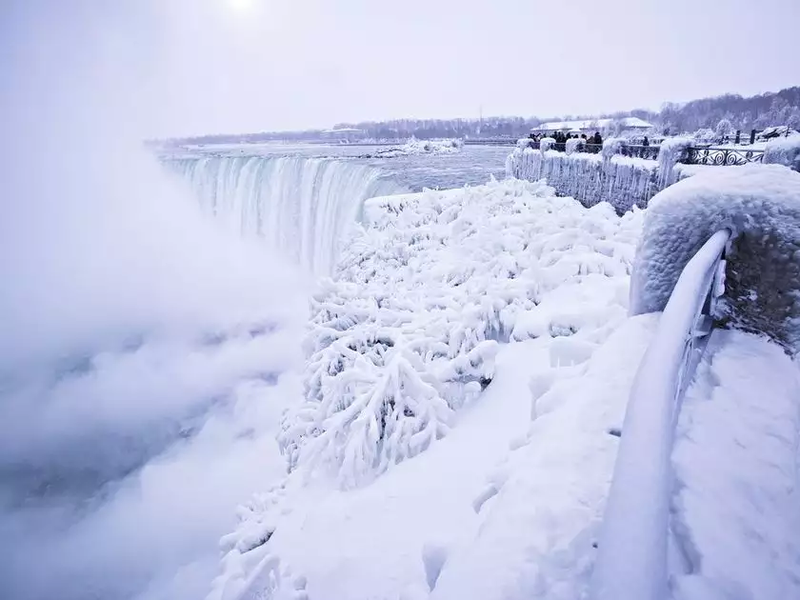 Niagara Falls Froze. “2017 is about to end with the coldest air of the year,” Environment Canada said in a news release. “A fresh surge of record-breaking Arctic air is forecast to encompass the entire province in its icy grip. A trough of low pressure currently over Southern Ontario will drop south of the Great Lakes tonight, opening the door to an even colder northerly wind.”Already, New Year’s Eve events planned for Ottawa and Toronto have been curtailed because of the cold. Ottawa 2017 organizers have moved New Year’s Eve events into city hall. 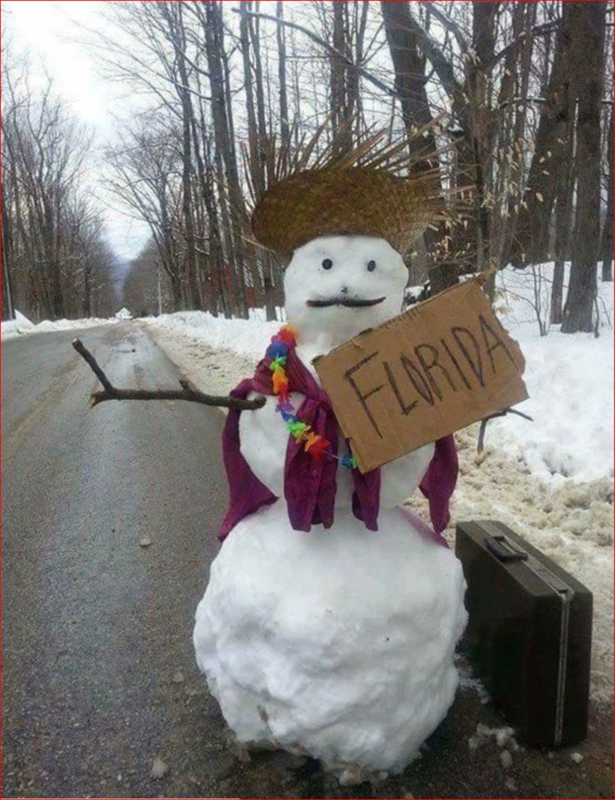 The only outside event will be the torch lighting set for 8:17 p.m. Sunday..
It’s so cold even this Quebec snowman is headed south. A week ago a Thurston County judge said Inslee’s executive fiat went too far. The rule targeted the state’s largest emitters of greenhouse gases, such as natural gas distributors, petroleum product producers and importers, power plants, metal manufacturers, and landfill operators. Large manufacturing operations, such as the Boeing Co. plant in Everett, also made the list of those expected to be affected at some point in the future. From the outset, the Association of Washington Business (AWB) opposed the approach as an overreach from the executive branch. Two years and 29,000 pages of legal filings later, a judge agreed. If environmentalists can get a measure on next November’s ballot and wealthy Inslee friends like billionaire Tom Steyer cq JC pony up enough dough, it could pass. In olden days kings ruled by fiat, but nowadays you need the people’s consent, disappointing to Obama and now Inslee. Excerpts below with my bolds: The short-term consequences of Arctic (and Antarctic) warming may already be felt in other latitudes. The long-term threat to coastlines is becoming even more dire. Greenland is melting, too—for now, it’s the biggest threat. 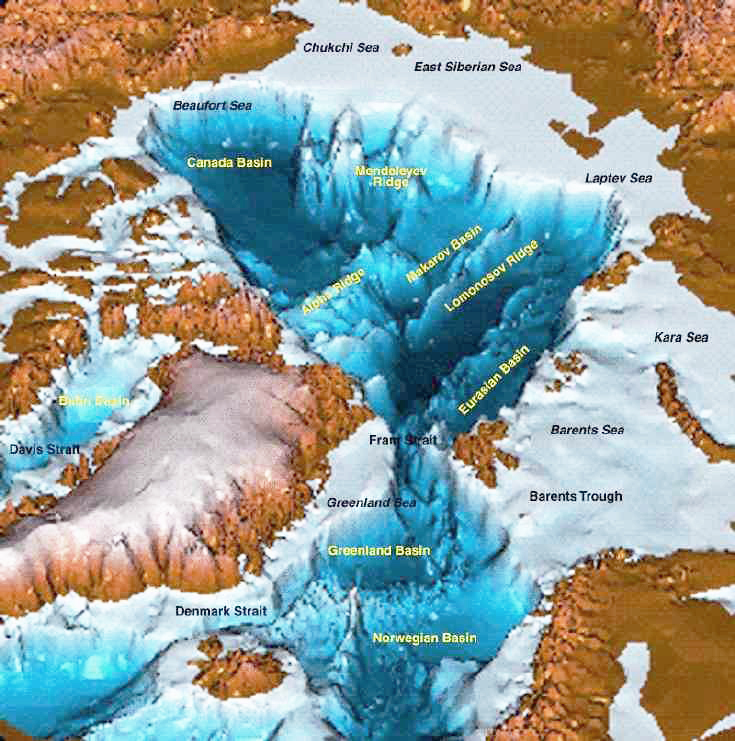 “Greenland has become Loserville,” said Jason Box, who tracks ice for the Geological Survey of Denmark and Greenland. “New observations from many different sources confirm that ice-sheet loss is accelerating,” the United States Global Change Research Program said in its comprehensive special report on climate science. “Up to 8.5 feet of global sea level rise is possible by 2100” in a worst-case emissions scenario. That’s almost 2 feet more than scientists expected just a few years ago. The AAs (Arctic Alarmists) are putting their faith in the BBs (Barents and Bering), the only two basins below average this year. Both are marginal to the Arctic Ocean and both are heavily affected by human marine activities, including shipping, navies, fishing, tourism and sea floor extraction. Fortunately, there is help for climate alarmists. 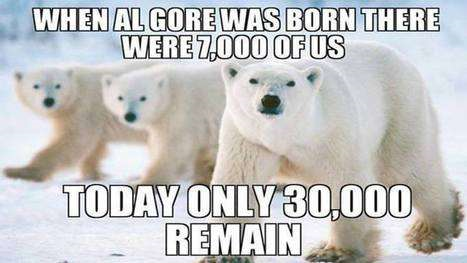 They can join or start a chapter of Alarmists Anonymous. By following the Twelve Step Program, it is possible to recover and unite in service to the real world and humanity. Step One: Fully concede (admit) to our innermost selves that we were addicted to climate fear mongering. Step Two: Come to believe that a Power greater than ourselves causes weather and climate, restoring us to sanity. Step Three: Make a decision to study and understand how the natural world works. Step Four: Make a searching and fearless moral inventory of ourselves, our need to frighten others and how we have personally benefited by expressing alarms about the climate. Step Five: Admit to God, to ourselves, and to another human being the exact nature of our exaggerations and false claims. Step Six: Become ready to set aside these notions and actions we now recognize as objectionable and groundless. Step Seven: Seek help to remove every single defect of character that produced fear in us and led us to make others afraid. Step Eight: Make a list of all persons we have harmed and called “deniers”, and become willing to make amends to them all. Step Nine: Apologize to people we have frightened or denigrated and explain the errors of our ways. Step Ten: Continue to take personal inventory and when new illusions creep into our thinking, promptly renounce them. Step Eleven: Dedicate ourselves to gain knowledge of natural climate factors and to deepen our understanding of nature’s powers and ways of working. Step Twelve: Having awakened to our delusion of climate alarm, we try to carry this message to other addicts, and to practice these principles in all our affairs. With a New Year close at hand, let us hope that many climate alarmists take the opportunity to turn the page by resolving a return to sanity. It is not too late to get right with reality before the cooling comes in earnest. This is your brain on climate alarm. Just say No! 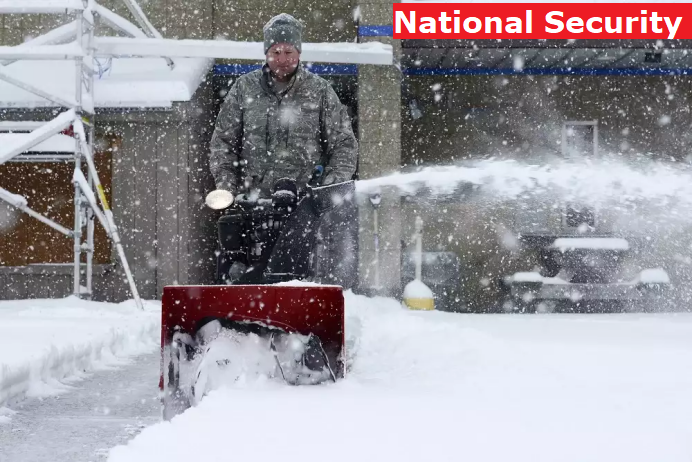 As I have been discussing the past two blog posts I continue to believe that this is the most critical period of the winter and will ultimately determine the character of the winter. In my opinion, we have approached a fork in the road and the atmosphere can take two possible paths one is a path where the rest of the winter is relatively mild across the mid-latitudes of the NH and the second is a colder path or solution. The tropospheric polar vortex has been relatively weak for much of the month of December as illustrated by the relatively warm polar cap geopotential heights (PCHs) for the first half of December that then boomeranged off the mid-stratosphere and after a short respite with colder tropospheric PCHs, warmer PCHs in the troposphere are predicted through the end of the month and into early January. Based on the easterly phase of the Quasi-Biennial Oscillation (QBO) I have been favoring a significant PV disruption most likely in January for much of the fall. A significant stratospheric PV disruption would then be followed by an extended period of severe winter weather across the mid-latitudes of the NH. However, I have to admit as of yet there are no signs of this scenario. There is still time but not much. 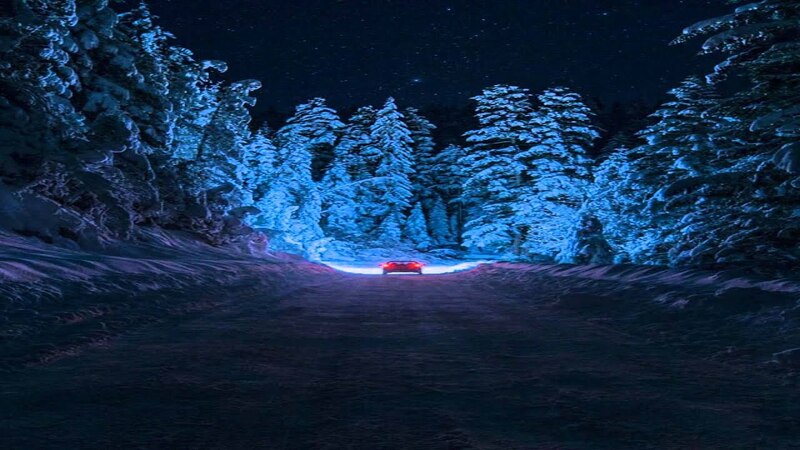 However, there is another scenario that could still yield a relatively cold winter and that is one analogous to what happened in the winter of 2013/14 where no significant disruptions of the stratospheric occurred but rather repeated minor disruptions that yielded a cold winter for central and eastern North America. Though at first, I acknowledged this possibility I was hesitant to favor this scenario. However, the longer the delay in a major disruption of the stratospheric PV the more I favor this scenario. The Arctic Oscillation (AO) is currently slightly positive and is predicted to trend slowly negative through the end of the week towards neutral. The forecast is for the AO to remain close to neutral next week, likely a sign of uncertainty. Figure 7. Forecasted snowfall anomalies (mm/day; shading) from 31 December 2017 – 4 January 2018. The forecasts are from the 00Z 18 December 2017 GFS ensemble. Note the new projection to provide finer resolution. The current positive AO is reflective of mixed pressure/geopotential height anomalies across the Arctic and mostly positive pressure/geopotential height anomalies across the mid-latitudes. The North Atlantic Oscillation (NAO) is also currently slightly positive with weak pressure/geopotential height anomalies across Greenland and Iceland and positive pressure/geopotential height anomalies across the mid-latitudes of the North Atlantic. A return to Ural ridging/blocking at the turn of the calendar year favors active energy transfer from the troposphere to the stratosphere. Another pulse is predicted to commence this week and peak the first few days of January. The pulse itself is likely related to relaxation of the pattern and mild temperatures across North America. However, the predicted resultant perturbation to the stratospheric polar vortex (PV) especially the building of heights over northwestern North America in my opinion could once again favor the return of cold temperatures across eastern North America later in January. Figure 9. Forecasted snowfall anomalies (mm/day; shading) from 5 – 9 January 2018. The forecasts are from the 00Z 25 December 2017 GFS ensemble. Troughing and/or cold temperatures will support the potential of additional snowfall across Eastern Europe, Siberia, West and East Asia, Alaska, Canada and the Northwestern US. Despite below normal temperatures, temperatures warm sufficiently to support snowmelt across the Eastern US (Figure 9). Ice did not grow this past week on the North Pacific side of the Arctic basin, still I expect the negative ice anomalies in the region to shrink. Sea ice is below normal in the Barents-Kara Seas as well and with time the greatest negative sea ice anomalies will likely reside in this region. As I have been writing for much of the fall I do believe that the record low sea ice anomalies in the Chukchi and Bering Seas has focused ridging/blocking in this region. Though model forecasts do not predict a return of the blocking in the foreseeable future. Recent research has shown that regional anomalies are important and the sea ice region most highly correlated with the winter AO is the Barents-Kara Seas region where low Arctic sea ice favors a negative winter AO and a cold Eurasia. Below normal sea ice in this region may be contributing to more active Wave Activity Flux/poleward heat transport predicted in the models that eventually could result in a negative AO. While the refreezing rate slowed in recent days, we again see contrast in the Pacific Basins. Mid month, Chukchi (top right) refroze almost completely, then reversed in the last week. Meanwhile, Okhotsk (Left) grew ice fairly steadily doubling in 12 days to cover nearly half of the annual maximum. At the moment the Arctic is slightly below the 10 year average, due to the slowdown. 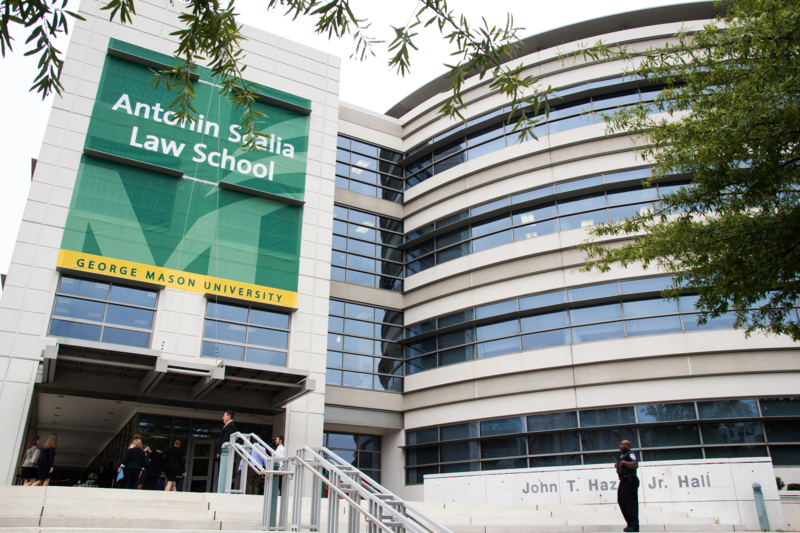 Recently I saw an activist website complaining that jurists were going to seminars led by staff at Antonin Scalia Law School, George Mason University. I wondered what might be on offer different than alarmist materials from Union of Concerned Scientists, National Resources Defense Council, Greenpeace, World Wildlife, and so on. So I went looking to see what was upsetting to the climate faithful, and found some unexpected resources for climate realists, including those serving on the bench. From time to time there are seminars where jurists discuss cases indicative of newer tendencies in litigation. The school publishes reports of these gatherings as well as studies and articles by legal scholars in its Journal of Law, Economics and Policy. This post relies on excerpts from several essays linked below. Public nuisance consists of a few elements, and they’re not very complicated. First of all, a public right must be involved—a right common to the general public that they have a legal right to enjoy. Second, there must be a substantial interference with that right that causes some sort of damage, or threatens to cause some sort of damage. 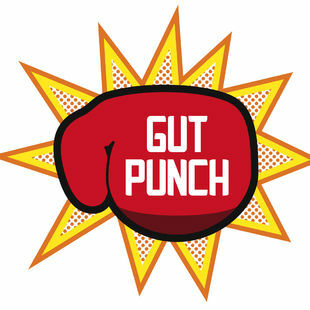 Two remedies are available in public nuisance litigation. 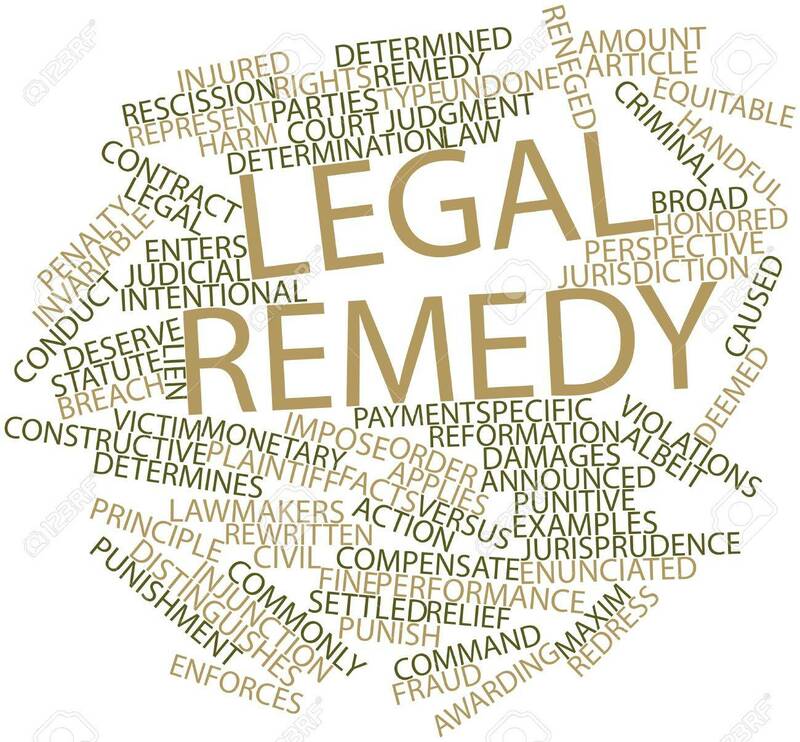 The first is an equitable remedy known as abatement, where a court can, upon finding a public nuisance, order the defendant to stop or to change its activities. The court can also order the defendant to remediate the problems caused by it. Under some circumstances, damages may be awarded. Costs of remediation and other compensatory awards may be available. Let’s look at a couple of examples. I live in Houston. Let’s say that during Hurricane Ike a tree fell from my property and crashed into my neighbor’s house and damaged his roof. Under those circumstances, no public right is involved. Under those circumstances, it’s simply a private dispute between landowners. It may be private nuisance that he has a tree in his living room, but it’s a matter between us as private land owners, and a public nuisance does not arise. But let’s say that the tree falls the other way and it blocks the street in front of my house. Under those circumstances, the public has a clear right to go down that road, to navigate it, to deal with whatever errands it needs to run. Since the fallen tree invades a right that’s common to everyone, it’s a public nuisance. The remedy is to order me to remove the tree. Now, that’s a simple illustration. Let’s look at global warming. Let’s say, for example, that several utility companies in the Northeast burn coal in their plants. Those plants, through their smokestacks, release greenhouse gases—all kinds of things like carbon dioxide, methane, various other things as a result of the combustion of the coal. Let’s say that, for the purposes of argument, science has established that those types of emissions cause or contribute to cause global warming, which is a deleterious thing to human beings. I don’t think anyone would doubt that the air we breathe is a common resource. So, there probably is a public right involved in these circumstances. But there are other issues. One of them is whether the emissions of these particular defendants are, in fact, substantially contributing or causing the climate change. Generally in tort cases involving public nuisance, there is a term, which we all know from negligence cases and other torts, called proximate causation. In proximate causation, there is a “but for” test: but for the defendant’s activity, would the injury have happened? Can we say that climate change would not have happened if these power plants, these isolated five power plants, were not emitting greenhouse gases? If they completely stopped, would we still have global warming? If you shut them down completely and have them completely dismantled, would we still have global warming? Is it really their emissions that are causing this, or is it the other billions and billions of things on the planet that caused global warming—such as volcanoes? Such as gases being naturally released through earth actions, through off-gassing? As Faulk says, the courts have not yet considered climate cases on their merits due to preemptive issues, such as standing, damages and liability. And there are additional hurdles before courts can rule on climate change. What about the separation of constitutional powers? 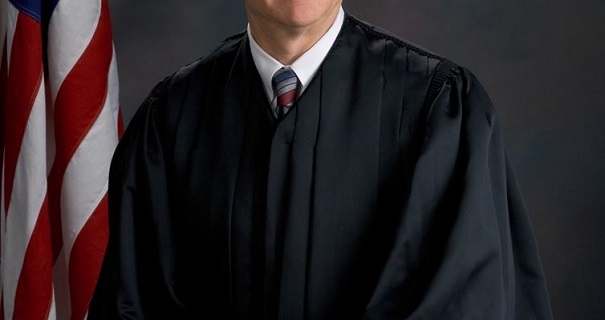 The idea expressed by the National Resources Defense Counsel and other NGOs was that they didn’t like democracy because it didn’t get them what they wanted, and so they were going to use the courts to run the American political process— fundamentally anti-democratic philosophy that they have consistently maintained—and might I add—relatively successfully. The theory of public nuisance the way it’s being utilized now, is simply lawlessness—nothing less than pure lawlessness. This is (stated by) the man that wrote the language on public nuisance, but never intended it to be used the way it is being used. It’s being used to try to change society. Is that the law’s job? Or is the law’s job to try to set standards so that people like me can advise clients on how they can obey the law? It’s so much fun to say, “Do the right thing.” What is the right thing? What about limits to liability? About every two or three years, the people that brought you asbestos and tobacco come up with new ideas; predatory ideas. 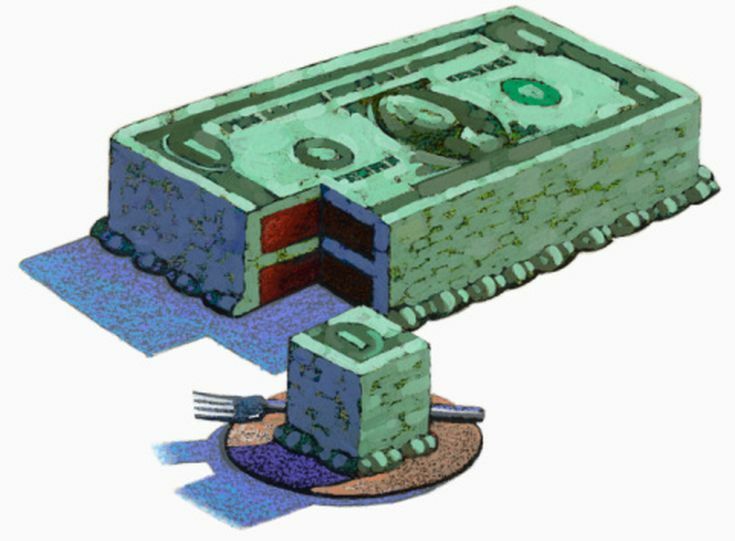 They’re designed to separate money from people that have it and take it somewhere else. So it is about the money. Now, try to explain that to your client. Put yourself in my posture. The only way I can safely advise a client to avoid liability in this environment is to not make, buy, sell, or insure anything—but that would make it really hard for us to do what the administration asks business to do, which is to hire people. The circuit court deemed the theory of public nuisance, as it’s being utilized, standardless liability—no standards. No ability for Joe Speelman to advise his client on how to do the right thing to avoid liability. There are no standards. I can’t tell you how to do it. And if I can’t do that, then the entire process by which business operates and makes things and sells things in this country, ultimately comes down—we get to what we really have, which is a casino mentality. So, as I said when I started—from those folks that brought you asbestos, lead litigation, and tobacco—we now have climate change. These are all interstate public nuisance cases. There are plaintiffs in some states suing defendants who, for the most part, are in other states. There is some overlap in some of the cases such as Comer and Kivalina, but generally, the interstate character of these public nuisance actions is very, very important. Now, what’s the problem with externalization across states? One: it’s very likely that this is going to be an inefficient externalization. That is to say you come up with some award from the court, and the basic idea of economics is we use the liability system, to what? To internalize costs. If people bear the costs of their actions, they have an incentive then to take precautions or take various steps to lower the cost to other people of the actions that they take. The inefficiency of the externalization here is very, very likely. Why? Among other things, there are very real benefits from global warming that can be expected to benefit lots of states and lots of cities. States that think they’re going to be beneficiaries, or think that they’re going to be real net losers from greenhouse gas emission reduction— because they’re states where a lot of electricity comes from burning coal and/or they mine and produce coal in those states—those states are not at the table in these litigations either. There are a lot of benefits and costs that are not included in this dyadic interstate public nuisance litigation. They’re almost sure to generate inefficient results. Another reason why they’re sure to generate inefficient results is because the benefit of any litigation depends upon the remedy affecting behavior, and behavior affecting the harm that people suffer. It’s simply a fact that by 2020, China is going to be responsible— forget about India and Brazil—for about 45% of the world’s greenhouse gas emission reduction. So, there’s no remedy in any of these cases that will provide any relief to any of the plaintiffs. Finally, what’s going to happen? Who knows what’s going to happen at the Supreme Court level. But these are likely to be very ineffective and counterproductive. Remember, for a lot of environmental groups, the reason for bringing these interstate public nuisance cases is they thought they were going to force Congress to act. Well, Congress didn’t act. A more recent symposium addressed a contextual shift in principles and assumptions, differing from older concepts underlying case law precedents from the past. Briefly put, the environment is no longer seen as static, but is rather dynamic at all time scales. And in parallel, the economic system is now recognized as dynamic and fluid, rather than determinative. Both of these paradigm shifts alter the way jurists and others consider environmental claims and responses to them. Most of today’s environmental laws and programs are based upon outmoded assumptions about the relative stability of natural systems when free of human interference. Scientists have understood for decades that ecosystems are anything but stable. To the contrary, ecosystems are incredibly dynamic and change over time due to both internal and external forces. An ecosystem is the “paradigmatic complex system,” exhibiting dynamic and discontinuous behavior. To be effective, therefore, environmental management systems must themselves be sufficiently adaptive. Noted ecologist Daniel Botkin argues that “solving our environmental problems requires a new perspective” of environmental concerns that incorporates contemporary scientific understandings and embraces humanity’s role in environmental management. Recognizing a new perspective is but the first step, however. There is also a need to identify how this perspective can inform environmental policy, not just on the ground but in the very institutional architecture of environmental law and management. Then comes the really hard part, for even if it is possible to conceive of how environmental management should proceed, it may be devilishly difficult to put such ideas into practice. Old habits die hard. Legal and institutional norms die even harder. The architecture of contemporary environmental law was erected when the equilibrium paradigm still held sway. As a consequence, the edifice of environmental law sits on an unstable foundation. The equilibrium paradigm justified “a wide range of prohibitions on human activities that alter ‘natural’ land and water systems” and other environmental restrictions on productive activity. Contemporary ecological science embraces a more dynamic understanding of the natural world and rejects the idea of a “balance of nature” that would exist but for human interference. Two insights about natural systems are essential to the contemporary view. First is the recognition that ecological systems are always in flux. There is no true “natural” state for ecosystems. No “climax” or endpoint toward which ecosystems move or evolve if left undisturbed. Second, in this day and age, there is no part of the globe in which ecosystems exist wholly apart from human influence. Many existing environmental laws impose binary decisions on agencies—either a species is endangered or it is not, a level of pollution may be anticipated to endanger health or it is not, etc. Once such determinations are made, specific regulatory consequences follow automatically. If a species is endangered, it triggers the regulatory requirements of the Endangered Species Act (ESA). If a pollutant may be reasonably anticipated to threaten health and welfare, certain types of emission controls must be imposed. Markets are also complex, adaptive, and dynamic systems. Just as it is not always possible to predict the ecological consequences of specific environmental management measures, it is often not possible to predict the market effects of such measures, or—perhaps more importantly—how such interventions will affect the interplay of economic decisions and environmental outcomes. Market actors will often respond to regulatory constraints in unanticipated ways, with unforeseen (and perhaps undesirable) effects. There are opportunities to improve the adaptive and responsive nature of environmental protection efforts in the United States, but such opportunities are inherently limited so long as environmental protection is dominated by a relatively centralized, top-down administrative structure. Conventional regulatory and administrative systems are not particularly adaptive or responsive to changing environmental conditions, or even to changed understanding of environmental needs. Bureaucratic systems change slowly and are rarely forward looking. This is due, in part, to legal constraints, but also due to the nature of monopolistic bureaucratic systems, and the inherent information limitations that hamper the ability of such systems to acquire and account for relevant information—let alone to encourage the discovery of such information in the first place. Bureaucratic structures are resistant to change, and this is particularly true where such resistance poses few risks. Regulatory agencies do not go out of business when they fail to adapt. To the contrary, a failing agency is more likely to see a budget increase than it is to close its doors. The feedback mechanisms that force private firms to be adaptive and responsive to changing market conditions are largely absent from the administrative state. So even if agency heads are willing to make the effort, they face a daunting gauntlet of interest group opposition and judicial scrutiny. According to Professor Ruhl, when the Fish and Wildlife Service (FWS) sought to integrate adaptive management into the habitat conservation plan (HCP) permitting process, interest group litigants and courts were quick to challenge the agency’s authority to incorporate greater flexibility into the program. Due process concerns about adaptive management are greatest where federal agencies are engaged in the regulation of private land or the imposition of restrictions that directly affect private rights, including some rights on federal lands. Adopting adaptive management policies and techniques is far less problematic in the context of managing government lands than where environmental management decisions encroach upon private interests or risk infringing upon private property rights. While there may be political obstacles, including interest group resistance, to reducing the procedural obligations of agencies engaged in resource management decisions, there are less likely to be judicially cognizable property interests of the sort that could implicate Due Process concerns. Daniel Botkin has led the shift in paradigm to Dynamic Ecology, especially in his influential book: Discordant Harmonies: a New Ecology for the Twenty-first Century. 1990 Oxford University Press, New York. Daniel B. Botkin is Professor Emeritus, University of California, Santa Barbara, in the Department of Ecology, Evolution, and Marine Biology. In 2014 he shared his view of the climate change issue in Testimony to the House Subcommittee on Science,Space and Technology. The whole document is enlightening, and included point-by-point critique of IPCC statements. His main points are highlighted below, while details and examples are in the full text. 1.I want to state up front that we have been living through a warming trend driven by a variety of influences. However, it is my view that this is not unusual, and contrary to the characterizations by the IPCC and the National Climate Assessment, these environmental changes are not apocalyptic nor irreversible. 2.My biggest concern is that both the reports present a number of speculative, and sometimes incomplete, conclusions embedded in language that gives them more scientific heft than they deserve. The reports are “scientific-sounding” rather than based on clearly settled facts or admitting their lack. Established facts about the global environment exist less often in science than laymen usually think. 3.HAS IT BEEN WARMING? Yes, we have been living through a warming trend, no doubt about that. The rate of change we are experiencing is also not unprecedented, and the “mystery” of the warming “plateau” simply indicates the inherent complexity of our global biosphere. Change is normal, life on Earth is inherently risky; it always has been. The two reports, however, makes it seem that environmental change is apocalyptic and irreversible. It is not. 4.IS CLIMATE CHANGE VERY UNUSUAL? No, it has always undergone changes. 5.ARE GREENHOUSE GASES INCREASING? Yes, CO2 rapidly. 6.IS THERE GOOD SCIENTIFIC RESEARCH ON CLIMATE CHANGE? Yes, a great deal of it. 7.ARE THERE GOOD SCIENTISTS INVOLVED IN THE IPCC 2014 REPORT? Yes, the lead author of the Terrestrial (land) Ecosystem Report is Richard Betts, a coauthor of one my scientific papers about forecasting effects of global warming on biodiversity. 8. ARE THERE SCIENTIFICALLY ACCURATE STATEMENTS AT PLACES IN THE REPORT? Yes, there are. 9. What I sought to learn was the overall take-away that the reports leave with a reader. I regret to say that I was left with the impression that the reports overestimate the danger from human-induced climate change and do not contribute to our ability to solve major environmental problems. I am afraid that an “agenda” permeates the reports, an implication that humans and our activity are necessarily bad and ought to be curtailed. 10. ARE THERE MAJOR PROBLEMS WITH THE REPORTS? Yes, in assumptions, use of data, and conclusions. 11. My biggest concern about the reports is that they present a number of speculative, and sometimes incomplete, conclusions embedded in language that gives them more scientific heft than they deserve. The reports, in other words, are “scientific-sounding,” rather than clearly settled and based on indisputable facts. Established facts about the global environment exist less often in science than laymen usually think. 12. The two reports assume and/or argue that the climate warming forecast by the global climate models is happening and will continue to happen and grow worse. Currently these predictions are way off the reality (Figure 1). Models, like all scientific theory, have to be tested against real-world observations. Experts in model validation say that the climate models frequently cited in the IPCC report are little if any validated. This means that as theory they are fundamentally scientifically unproven. 13. The reports suffer from using the term “climate change” with two meanings: natural and human-induced. These are both given as definitions in the IPCC report and are not distinguished in the text and therefore confuse a reader. (The Climate Change Assessment uses the term throughout including its title, but never defines it.) There are places in the reports where only the second meaning—human induced—makes sense, so that meaning has to be assumed. There are other places where either meaning could be applied. 14. Some of the report conclusions are the opposite of those given in articles cited in defense of those conclusions. 15. Some conclusions contradict and are ignorant of the best statistically valid observations. 16. The report for policy makers on Impacts, Adaptation, and Vulnerability repeats the assertion of previous IPCC reports that “large fraction of species” face “increase extinction risks” (p15). Overwhelming evidence contradicts this assertion. And it has been clearly shown that models used to make these forecasts, such as climate envelope models and species-area curve models, make incorrect assumptions that lead to erroneous conclusions, over-estimating extinction risks. Surprisingly few species became extinct during the past 2.5 million years, a period encompassing several ice ages and warm periods. 17. THE REPORT GIVES THE IMPRESSION THAT LIVING THINGS ARE FRAGILE AND RIGID, unable to deal with change. The opposite is to case. Life is persistent, adaptable, adjustable. 18. STEADY-STATE ASSUMPTION: There is an overall assumption in the IPCC 2014 report and the Climate Change Assessment that all change is negative and undesirable; that it is ecologically and evolutionarily unnatural, bad for populations, species, ecosystems, for all life on planet Earth, including people. This is the opposite of the reality. 19. The summary for policy makers on Impacts, Adaptation, and Vulnerability makes repeated use of the term “irreversible” changes. A species going extinct is irreversible, but little else about the environment is irreversible. 20. The extreme overemphasis on human-induced global warming has taken our attention away from many environmental issues that used to be front and center but have been pretty much ignored in the 21st century. 21. Do the problems with these reports mean that we can or should abandon any concerns about global warming or abandon any research about it? Certainly not, but we need to put this issue within an appropriate priority with other major here-and-now environmental issues that are having immediate effects. 22. The concerns I have mentioned with the IPCC apply as well to the White House’s National Climate Assessment. The good news: Some people in the legal community are reflecting analytically about climate claims appearing in litigation, and are speaking out about the failure of facts and logic to support the allegations. Legal scholarship has come to accept as true the various pronouncements of the Intergovernmental Panel on Climate Change (IPCC) and other scientists who have been active in the movement for greenhouse gas (ghg) emission reductions to combat global warming. The only criticism that legal scholars have had of the story told by this group of activist scientists – what may be called the climate establishment – is that it is too conservative in not paying enough attention to possible catastrophic harm from potentially very high temperature increases. Scientists who have been leaders in the process of producing these Assessment Reports (“AR’s”) argue that they provide a “balanced perspective” on the “state of the art” in climate science,with the IPCC acting as a rigorous and “objective assessor” of what is known and unknown in climate science. Legal scholars have accepted this characterization, trusting that the IPCC AR’s are the product of an “exhaustive review process” – involving hundreds of outside reviewers and thousands of comments. Within mainstream environmental law scholarship, the only concern expressed about the IPCC and “consensus” climate change science is that the IPCC’s process has allowed for too much government influence (especially from China and the U.S.), pressure that has caused the IPCC’s future projections to be too cautious – too hesitant to confidently project truly catastrophic climate change. This paper constitutes such a cross-examination. As anyone who has served as an expert witness in American litigation can attest, even though an opposing attorney may not have the expert’s scientific training, a well prepared and highly motivated trial attorney who has learned something about the technical literature can ask very tough questions, questions that force the expert to clarify the basis for his or her opinion, to explain her interpretation of the literature, and to account for any apparently conflicting literature that is not discussed in the expert report. My strategy in this paper is to adopt the approach that would be taken by a non-scientist attorney deposing global warming scientists serving as experts for the position that anthropogenic ghg emissions have caused recent global warming and must be halted if serious and seriously harmful future warming is to be prevented – what I have called above the established climate story. 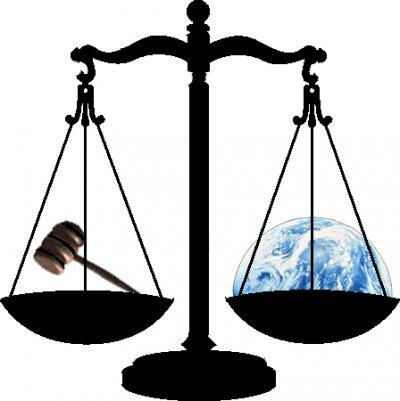 To use legal terms, is the work by the IPCC and establishment story lead scientists a legal brief – intended to persuade – or a legal memo – intended to objectively assess both sides? The second and related objective of this Article is to use the cross examination to identify what seem to be the key, policy-relevant areas of remaining uncertainty in climate science, and to then at least begin to sketch the concrete implications of such remaining uncertainty for the design of legal rules and institutions adopted to respond to perceived climate change risks. Far from turning up empty, my cross examination has (initially, to my surprise) revealed that on virtually every major issue in climate change science, the IPCC AR’s and other summarizing work by leading climate establishment scientists have adopted various rhetorical strategies that seem to systematically conceal or minimize what appear to be fundamental scientific uncertainties or even disagreements. The bulk of this paper proceeds by cataloguing, and illustrating with concrete climate science examples, the various rhetorical techniques employed by the IPCC and other climate change scientist/advocates in an attempt to bolster their position, and to minimize or ignore conflicting scientific evidence. 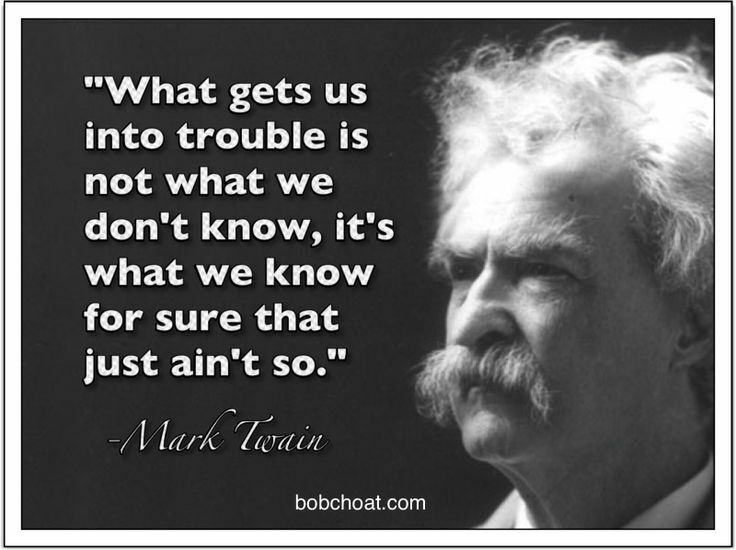 There are, to be sure, many chapters in the IPCC Assessment Reports whose authors have chosen to quite fully disclose both what is known as well as what is unknown, and subject to fundamental uncertainty, in their particular field of climate science. Still, the climate establishment story — comprising all of the IPCC Assessment Reports, plus the IPCC’s “Policymaker Summaries,” plus the freelance advocacy efforts of activist climate scientists (exemplified by James Hansen of NASA) – seems overall to comprise an effort to marshal evidence in favor of a predetermined policy preference, rather than to objectively assess both what is known and unknown about climatic variation and its causes. How many other jurists have girded themselves for this battleground? The news was reported by the Federalist Trump Admin To Remove Climate Change From List Of National Security Threats. Excerpts below with my bolds. The Trump administration will reverse course from previous Obama administration policy, eliminating climate change from a list of national security threats. The National Security Strategy to be released on Monday will emphasize the importance of balancing energy security with economic development and environmental protection, according to a source who has seen the document and shared excerpts of a late draft. 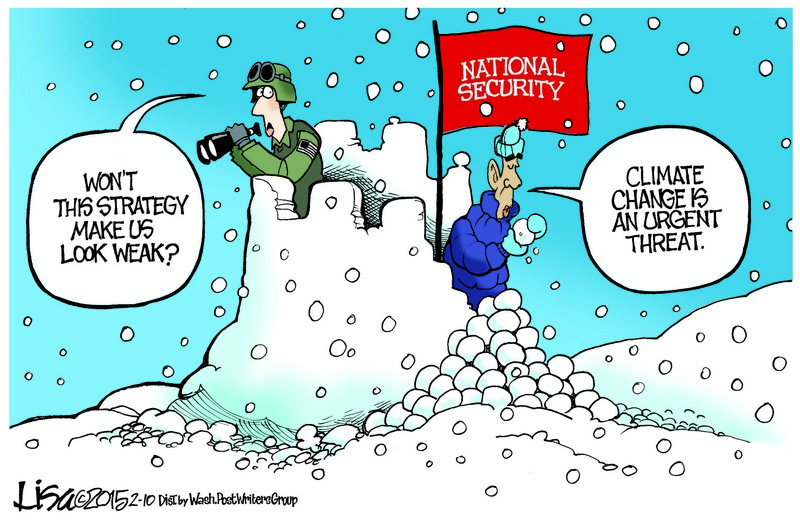 President Obama made climate change, and the burdensome regulations that accompany its focus, a primary focus of his administration, including in his National Security Strategy released in 2015. “[W]e are working toward an ambitious new global climate change agreement to shape standards for prevention, preparedness, and response over the next decade,” that report said. In September 2016, President Obama released a memorandum requiring federal agencies to consider the effects of climate change in the development of national security-related doctrine, policies, and plans. All of this alarmed critics concerned with more pressing security risks. North Korea seeks the capability to kill millions of Americans with nuclear weapons. Iran supports terrorist groups and openly calls for our destruction. Jihadist terrorist organizations such as ISIS and al Qaeda are determined to attack the United States and radicalize Americans with their hateful ideology. 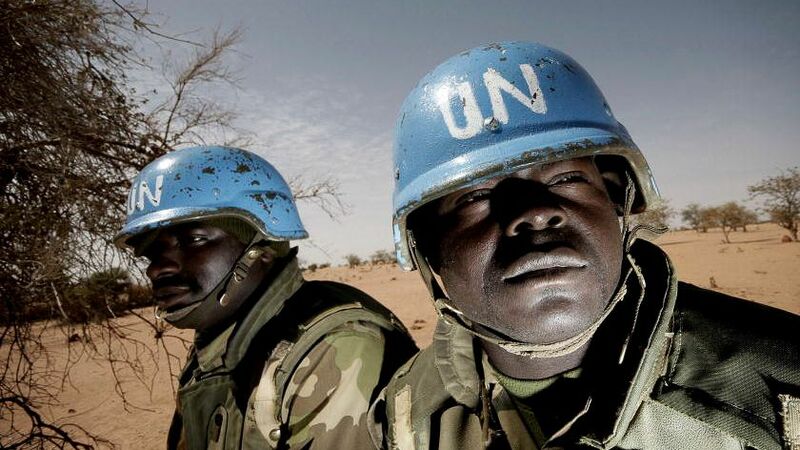 States and non-state actors undermine social order with drug and human trafficking networks, which drive violent crimes and cause thousands of American deaths each year…. Strengthening control over our borders and immigration system is central to national security, economic prosperity, and the rule of law. Terrorists, drug traffickers, and criminal cartels exploit porous borders and threaten U.S. security and public safety. These actors adapt quickly to outpace our defenses. In the first two weeks of December we can see Chukchi at the left filling in with only 8% open water remaining, and Bering starting to freeze. On the right, Hudson bay is almost fully iced, while Baffin is freezing toward Greenland. Maximum ice is showing in CAA (Canadian Archipelago), Beaufort, East Siberian, Central Arctic, Laptev and Kara. Arctic Ice Extents have reached 12M km2, up from 4.6M km2 at Sept. minimum. This means 50% of the annual maximum has been gained, with 20% of ice cover to be added in the three months before mid March. 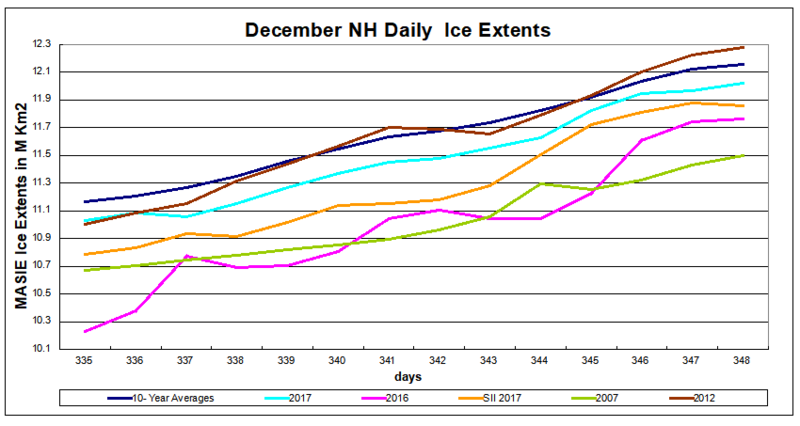 The graph compares extents over the first 14 days of December. 2017 has reached 12M km2, close to the 10 year average, while 2012 has recovered with a surplus. 2016 is about 260k km2 behind and 2007 lags by 520k km2. At this point MASIE and SII are both tracking the 10-year average, with SII about 200k km2 lower. The Table below shows where ice is located on day 348 in regions of the Arctic ocean. 10 year average comes from 2007 through 2016 inclusive. The deficits to average are primarily in Barents and Bering Seas. Surpluses are large in Hudson Bay, Okhotsk and Kara Seas. Compared to 2007, most seas are in surplus, with only Hudson Bay slightly late. 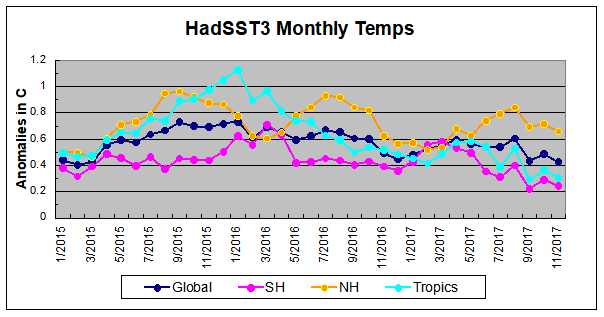 The chart below shows SST monthly anomalies as reported in HadSST3 starting in 2015 through November 2017. After a steep drop in September, October temps bumped upward in response. The rise was led by anomaly increases of about 0.06 in both the Tropics and SH, compared to drops of about 0.20 the previous month. NH was virtually the same as September. Global average anomaly changed as much as the Tropics and SH, but remained lower than the three previous Octobers. Now in November, the downward trend has resumed. As will be shown in the analysis below, 0.4C has been the average global anomaly since 1995. Click on image for clearer details. This year Hudson Bay added 728k km2 from day 318 to 344 (yesterday). Nov. 14 showed 280k km2 rising to 1008k on Dec. 10, 2017. About 20% of the basin is yet to freeze. I doubt Leonard Cohen had climate change in mind when he wrote this masterpiece. But he did have a pertinent poetic insight; namely, that social proof is an unreliable guide to the truth.